and Jupiter) and Pluto and Eris (2003 UB 313) in the Edgeworth-Kuiper Belt (beyond the orbit of Neptune). 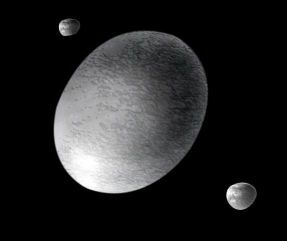 On September 17, 2008, the International Astronomical Union (IAU) announced that the trans-Neptunian object 2003 El61 had been designated a "dwarf planet and accepted the Polynesian names submitted by its discoverers for the primary body (Haumea) and its two moons, Hi'aka and Namaka, (press release). 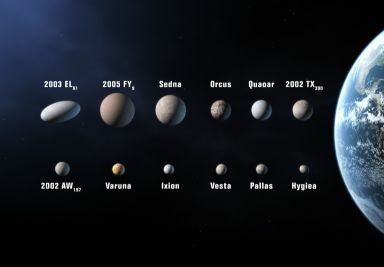 On July 14, 2008, the IAU declared the outer Solar System object 2005 FY9 to be a dwarf planet and accepted the Polynesian name Make-make submitted by its discoverers. Planet - This is a celestial body that: (a) is in orbit around the Sun; (b) has sufficient mass for its self-gravity to overcome rigid body forces so that it assumes a nearly round shape (due to a hydrostatic equilibrium); and (c) has cleared the neighborhood around its orbit. 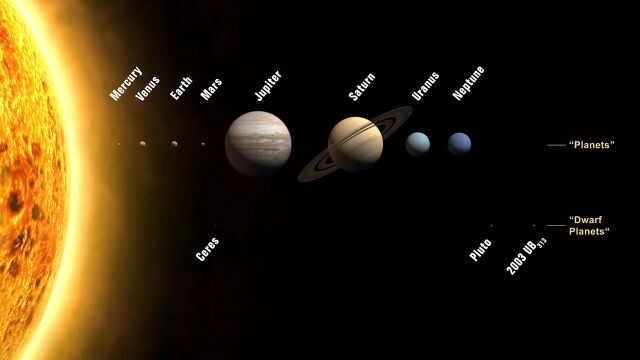 As now defined, the Solar System has eight planets: Mercury, Venus, Earth, Mars, Jupiter, Saturn, Uranus, and Neptune. 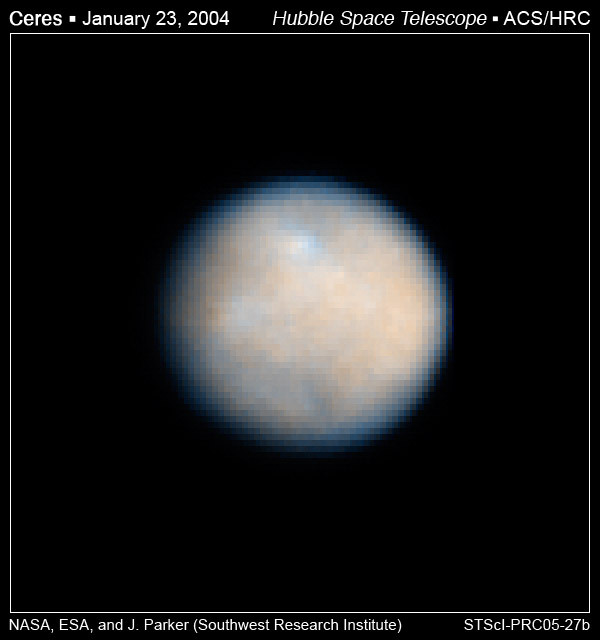 Dwarf Planet - This is a celestial body that: (a) is in orbit around the Sun; and (b) has sufficient mass for its self-gravity to overcome rigid body forces so that it assumes a nearly round shape (due to a hydrostatic equilibrium); but (c) has not cleared the neighborhood around its orbit; and (d) is not a satellite of another planet. 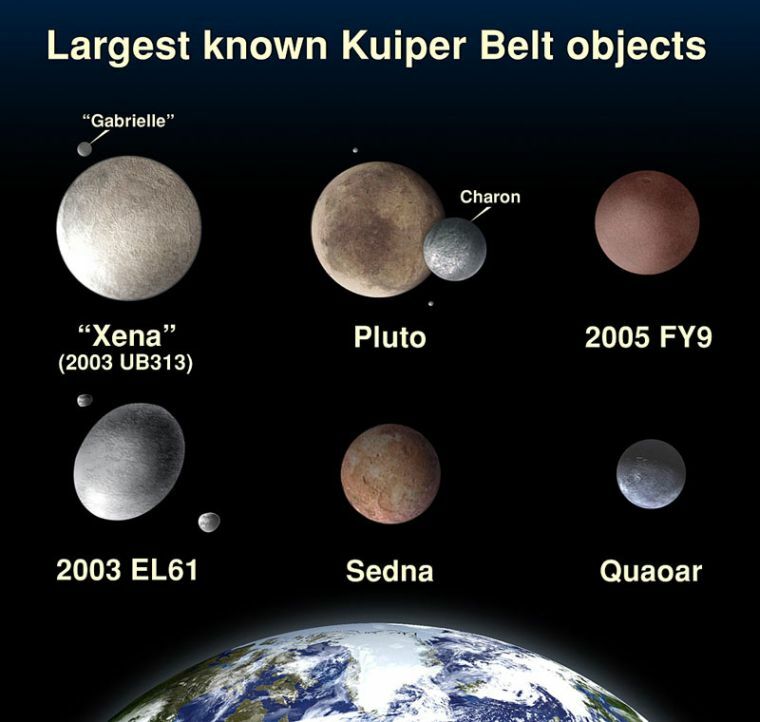 As defined, the Solar System has probably has at least one dwarf planet in the Main Asteroid Belt (Ceres), Edgeworth-Kuiper Belt (Pluto and Eris); and Oort Cloud (possibly Sedna). In addition, the "dwarf planet" Pluto is recognized as a prototype of a new class of trans-Neptunian objects. Smaller Solar System Bodies - This category collectively refers to all other celestial bodies orbiting our Sun, Sol (including asteroids, comets, and satellites). Some astronomers believe that these controversial definitions will be revisited before the next IAU assembly in 2009. (More discussion is available from IAU 2006, Astronomy Picture of the Day; and from "Planetesimals to Brown Dwarfs: What is a Planet?," Basri and Brown, 2006.) For example, on November 6, 2000, astronomers associated with exoplanets.org (Geoffrey W. Marcy and R. Paul Butler) began using a generalized definition of "planet" that they also apply to objects found outside the Solar System. 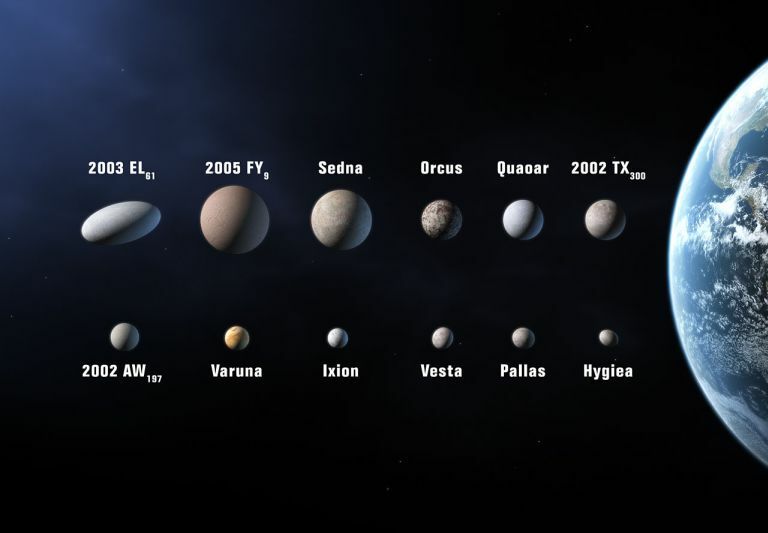 By the IAU's definition, dwarf planets can be found anywhere in the Solar system. 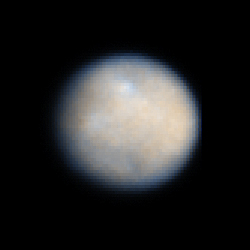 Ceres, the largest Main-Belt asteroid, has been acknowledged by many astronomers as a dwarf planet. In addition, the next three largest asteroids in the Main Belt (Vesta, Pallas, and Hygeia) may also be "round enough" to be eventually classified as dwarf planets. Based on tentative size estimates, most candidates for dwarf planethood, however, reside beyond the orbit of Neptune in the Edgeworth-Kuiper Belt. Many astronomers have already recognized Eris (2003 UB313), Pluto, Haumea, and Make-make as dwarf planets and so anticipate that many more icy Edgeworth-Kuiper objects (EKOs) already discovered will eventually be classified as dwarf planets as well. 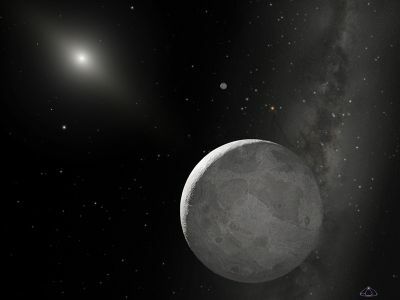 Moreover, some astronomers are monitoring over a dozen more unannounced but recently discovered EKOs that also may eventually be found to be large and round enough to be designated as dwarf planets. The huge and loosely defined region of the Solar System's Oort Cloud also holds candidates for dwarf planethood. 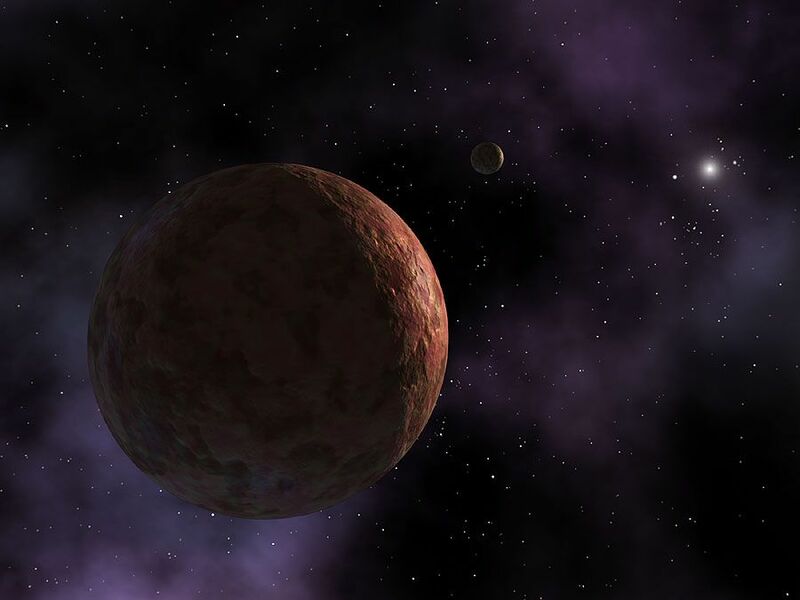 Sedna, designated by some astronomers as a member of the "inner" Oort Cloud, may also become classified as a dwarf planet. More Oort-Cloud candidates may eventually be detected, but visual confirmation of their spherical shape would likely be difficult. © 2006-2008 Sol Company. All Rights Reserved.